Since The Hunger Games: Mockingjay – Part 1, the end of the year has been rather sparse as far as sci-fi is concerned. 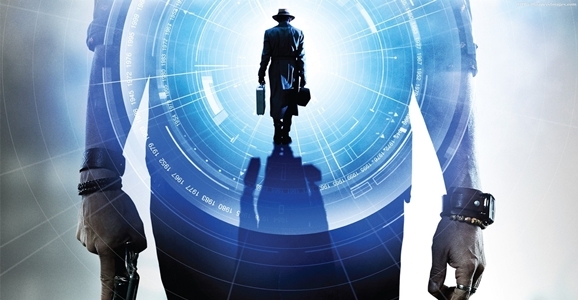 Fortunately for us, we won’t have to wait too far into 2015 to get our first intriguing wide release of the year, as the Spierig Brothers’ Predestination opens January 9. And if you want to get me a late Christmas present, you can go see it in the theater. I’m afraid a lot of people are going to sit this one out and miss something really cool. January is not exactly known as a hotbed of quality film releases, and studios often use it as a dumping ground for movies that didn’t turn out as well as they hoped. But Predestination is not one of those, and my guess as to why it has this less than optimal release date is that they have zero idea how the hell to market this movie, because it’s definitely not the movie being they’re selling. If you’ve looked at the trailers, you can’t help but think of this as TimeCop or Minority Report, something you’ve seen before. But while there are shades of familiar stories, this is something entirely different. Ethan Hawke plays a temporal agent who travels through time preventing crimes before they happen, but that’s a relatively minor part of the plot. The story is way more esoteric than that, looping back on itself time and again, playing up issues of identity, and taking strange turns that, while totally earned and established, leave you scratching your head…in the good way. Hell, the bulk of the story is framed as a barroom discussion. This isn’t your standard action-packed thriller. Predestination is a constantly shifting landscape, a slow burn that never takes you where you expect, but it’s a nice ride. If people give this a shot, I think a lot of you are going to be pleasantly surprised at the cerebral, engaging, unusual film that you’ll find.